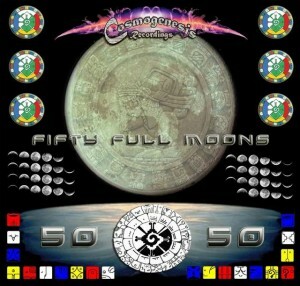 Just in time for summer festival season, Cosmogenesis Recordings returns with 50 Full Moons, an epic double-CD blockbuster loaded with powerful full-on crowd thrillers and pumping progressive floor burners. Rippling bass lines, soaring melodies, and energetic grooves intersect on this massive release, the seventh from Cosmogenesis. With material gathered from Mexico, Russia, Thailand, Israel, Canada, and the UK, this compilation has a truly international character. Full-on fanatics are not going to want to miss this one! MP3 Download | WAV Download · Download count: 17,409. This work is available under a Creative Commons licence. Be sure to check out previous releases from Cosmogenesis Recordings such as SOM’s debut album 55 Full Moons, and 60 Full Moons. Wicked stuff! Thank you very much!! Thank you VERY much for the music. This truly rocks. guys you are a KILLA !! Hey mate,thx a lot for the nice and free stuff. Great Work!.Thank you very much for the tracks.Peace and Beats from Seville. thanks for the music!love it! thanks alot for the tunes..im really digging…would like to hear more of your stuff. this is rocking stuff. i like. wat a great thought about the lossless download for all. quality is the key and a big boom to you for spreading that. I’d like to say that your attitude is awesome! As one of out friends said…The world needs more ppl like you! For now I must say that Cyber Motion stuff RULEZZZ! Grooving basslines and wicked fx!!! I’ll post a l8r review! Still rocking out to Pure Energy and others years later. Thanks for this, guys.